First read the whole book through, then go back and try some of these activities with your child to make the book come alive! See if you can find Patches the cat on almost all of the pages. What is she doing in each scene? There are 4 books that the Bears read that are open and you can see the words of the story. Guess what happens next in these books that the Bears are reading. Use your imagination to make your own story! 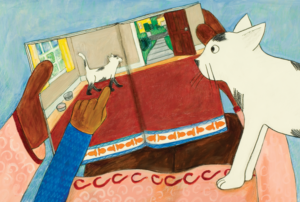 On the page where Patches is looking at the book about Kitty, see what is the same and what is different in the spots on Patches and on Kitty. Look at the map of the Bear Family’s house that is in the beginning of the book. Can you see Patches? 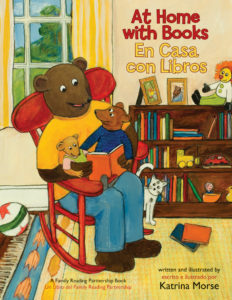 Can you see all the places that the Bear Family reads books and the little books that are there in the rooms? Draw a map of your home. Which rooms connect by doorways? Show the furniture in the rooms too. You can also make a pretend home and add any rooms you can imagine! Make a list of all the places your family likes to read books together in your home and other spots. Do you read outside, in the car or on the bus, while waiting for appointments? Draw a picture of all the family members and friends who read to you. 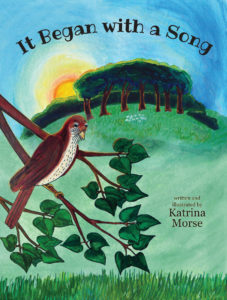 Listen to the “Meadow Song and Dance” (performed by John Simon) that is at the end of “It Began with a Song.” Here are the Movements of the song that you can dance together and here is a Kindergarten Class Singing the song together (from Belle Sherman Elementary School in Ithaca, NY). Can you and your child figure out which movement of the song goes with which character from the book? Can you move like a snake? Can you hop like a rabbit? How would a bear dance? Move like the wind does. Do a sunshine dance. Go outside and start looking. How many shapes of leaves can you find? Are there long skinny grass leaves? Can you find any heart-shaped or oval-shaped leaves? Do you see any animals or insects? How does it look different outside in the different seasons? • What adventures would you have if you were a mole? Imagine what you do in your home underground. Tell a story about it. • Pretend you are a rock outside. Imagine what happens around you during the day and then during the night. • Do you think it would be fun to be able to fly like a bird? Imagine where you would go if you had wings and could soar in the sky. There is a section of this book where animals are introduced by number. Go through the book again and find all the animals as they are pictured for the first time. There is one _____, two _______, three _______, four _______, and five _______. Did you figure them all out? Make your own book by folding pieces of paper in half and putting them together. Draw a picture on each page to tell the story. How does your story begin? What happens in the middle? How does it end?